How does the Internet work? The Internet's growth has become explosive and it seems impossible to escape the bombardment of www.com's seen constantly on television, heard on radio, and seen in magazines. Because the Internet has become such a large part of our lives, a good understanding is needed to use this new tool most effectively. This whitepaper explains the underlying infrastructure and technologies that make the Internet work. It does not go into great depth, but covers enough of each area to give a basic understanding of the concepts involved. Here we see Diagram 1 redrawn with more detail. The physical connection through the phone network to the Internet Service Provider might have been easy to guess, but beyond that might bear some explanation. The ISP maintains a pool of modems for their dial-in customers. This is managed by some form of computer (usually a dedicated one) which controls data flow from the modem pool to a backbone or dedicated line router. This setup may be refered to as a port server, as it 'serves' access to the network. Billing and usage information is usually collected here as well. So how do packets find their way across the Internet? Does every computer connected to the Internet know where the other computers are? Do packets simply get 'broadcast' to every computer on the Internet? The answer to both the preceeding questions is 'no'. No computer knows where any of the other computers are, and packets do not get sent to every computer. The information used to get packets to their destinations are contained in routing tables kept by each router connected to the Internet. Routers are packet switches. A router is usually connected between networks to route packets between them. Each router knows about it's sub-networks and which IP addresses they use. The router usually doesn't know what IP addresses are 'above' it. Examine Diagram 5 below. The black boxes connecting the backbones are routers. The larger NSP backbones at the top are connected at a NAP. Under them are several sub-networks, and under them, more sub-networks. At the bottom are two local area networks with computers attached. But what if you don't know the IP address of the computer you want to connect to? What if the you need to access a web server referred to as www.anothercomputer.com? How does your web browser know where on the Internet this computer lives? The answer to all these questions is the Domain Name Service or DNS. The DNS is a distributed database which keeps track of computer's names and their corresponding IP addresses on the Internet. Many computers connected to the Internet host part of the DNS database and the software that allows others to access it. These computers are known as DNS servers. No DNS server contains the entire database; they only contain a subset of it. If a DNS server does not contain the domain name requested by another computer, the DNS server re-directs the requesting computer to another DNS server. The Domain Name Service is structured as a hierarchy similar to the IP routing hierarchy. The computer requesting a name resolution will be re-directed 'up' the hierarchy until a DNS server is found that can resolve the domain name in the request. Figure 6 illustrates a portion of the hierarchy. At the top of the tree are the domain roots. Some of the older, more common domains are seen near the top. What is not shown are the multitude of DNS servers around the world which form the rest of the hierarchy. When an Internet connection is setup (e.g. for a LAN or Dial-Up Networking in Windows), one primary and one or more secondary DNS servers are usually specified as part of the installation. This way, any Internet applications that need domain name resolution will be able to function correctly. For example, when you enter a web address into your web browser, the browser first connects to your primary DNS server. After obtaining the IP address for the domain name you entered, the browser then connects to the target computer and requests the web page you wanted. One of the most commonly used services on the Internet is the World Wide Web (WWW). The application protocol that makes the web work is Hypertext Transfer Protocol or HTTP. Do not confuse this with the Hypertext Markup Language (HTML). HTML is the language used to write web pages. HTTP is the protocol that web browsers and web servers use to communicate with each other over the Internet. It is an application level protocol because it sits on top of the TCP layer in the protocol stack and is used by specific applications to talk to one another. In this case the applications are web browsers and web servers. HTTP is a connectionless text based protocol. Clients (web browsers) send requests to web servers for web elements such as web pages and images. 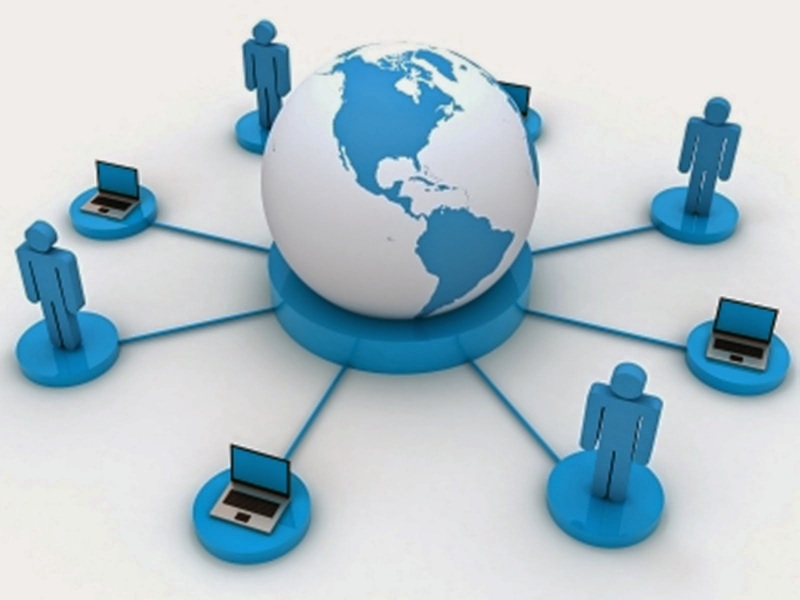 After the request is serviced by a server, the connection between client and server across the Internet is disconnected. A new connection must be made for each request. Most protocols are connection oriented. This means that the two computers communicating with each other keep the connection open over the Internet. HTTP does not however. Before an HTTP request can be made by a client, a new connection must be made to the server. Below are some interesting links associated with some of the topics discussed. (I hope they all still work. All open in new window.) http://www.ietf.org/ is the home page of the Internet Engineering Task Force. This body is greatly responsible for the development of Internet protocols and the like. How does the Internet work? Good question! The Internet's growth has become explosive and it seems impossible to escape the bombardment of www.com's seen constantly on television, heard on radio, and seen in magazines. Because the Internet has become such a large part of our lives, a good understanding is needed to use this new tool most effectively. This whitepaper explains the underlying infrastructure and technologies that make the Internet work. It does not go into great depth, but covers enough of each area to give a basic understanding of the concepts involved. For any unanswered questions, a list of resources is provided at the end of the paper. Any comments, suggestions, questions, etc. are encouraged and may be directed to the author at rshuler@gobcg.com.